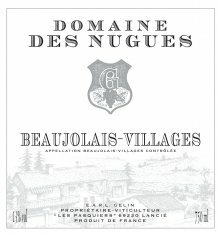 Thanksgiving is just a few days away, and we invite you to enjoy a taste of Domaine des Nugues Beaujolais-Villages 2010 for your holiday feast. This particular wine offers elegance and subtle aromas of spices, deep ruby color and red berries on the palate. Domaine des Nugues harvests the Gamay grapes by hand from vines ranging from 45 to over 100 years old. Unlike most Beaujolais-Villages which are grown in the southern part of the region, this vineyard is in the northern part of Beaujolais and is surrounded by the Crus of Mouline á Vent, Fleurie, and Morgon. This wine is best when aged one to three years, hence the 2010 is at its peak right now and is perfectly paired with a turkey dinner.